Since being elected to government in 2013, Australia's Minister for Immigration and Border Protection, Scott Morrison, has spent his time increasingly attacking, demonising and persecuting asylum seekers. The Tony Abbott led government has failed to keep much of their pre-election promises, but the 'stop the boats' promise is one that they have ostensibly kept. They kept the promise by breaking a number of international laws and skirting with piracy. Australian forces hijacked boats and towed them into international waters or forced the passengers into life rafts and sent them to Indonesia. Meanwhile, asylum seekers who had already arrived into Australia were left to languish in prison camps on Nauru, Manus Island and Christmas Island in breach of numerous international conventions on refugees, children and torture. The United Nations has condemned Australia's treatment of asylum seekers and stated that it breaches these conventions. The LNP justify this by saying they have saved thousands of lives from drowning at sea. What a load of garbage! Prime Minister Tony Abbott gave two naval vessels to the Sri Lankan government to stop people, predominantly Tamils, from escaping that government's brutal persecution of them. So while this may prevent them dying at sea, they can now be tortured and murdered by the Sri Lankan regime. This makes Australia complicit in human rights abuses. Similar, Scott Morrison began returning asylum seekers to their countries of origin if there was a less than 50% change of torture or murder. 50%! Would Morrison send his children to the shops if there was a 49% chance they would be tortured, raped, murdered? Of course not. Morrison is aiding and abetting brutal regimes around the world with his disgraceful and deplorable policies. If these policies are about protecting lives, then how can the government justify imprisoning innocent people (including babies and toddlers) without charge in camps that deny basic human rights. To top all of this off, Morrison claims to be a Christian and even worse, many Christians support his brutal policies. 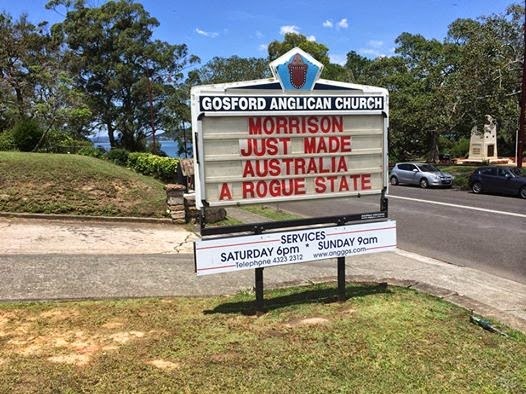 Thank God, there are other Christians who see Morrison and the government's despicable policies for what they are: pure evil. The Uniting Church of Australia has condemned them. Pope Francis has condemned them. Anglican churches have condemned them. There aren't just Christian groups protesting and criticising Morrison's practices, but others including Amnesty International, Red Cross, the Greens, left wing parties and refugee rights organisations. On 4 December 2014, Morrison managed to get the Migration and Maritime Powers Legislation Amendment (Resolving the Asylum Legacy Case Load) Bill 2014 through parliament by using more than 700 children in detention as a bargaining chip. Morrison said he would release all children in detention if the Bill was passed. Of course, he could have released the children anyway, so he was essentially saying he would keep children in detention if the parliament didn't let him have his inhumane way. Senator Sarah Hansen-Young reported to parliament on 4 December 2014, that Morrison had arranged for children in detention on Christmas Island to call Senator Ricky Muir begging they be released. Muir's vote was the last one needed by Morrison for the Bill to pass. Morrison has taken politics to its lowest moral point in decades. As Minister for Immigration, Morrison is the legal guardian of the children. Instead of acting like their guardian, he is acting like their kidnapper demanding a ransom for their release. His behaviour is puerile, perverse and reprehensible. The Bill allows Morrison to send asylum seekers to anywhere in the world, including countries that have poor human rights records or aren't equipped to adequately care for them, such as Cambodia and Papua New Guinea. The Bill re-introduces Temporary Protection Visas for the 30,000 asylum seekers awaiting a decision, with the caveat that asylum seekers on TPVs can be deported at any time and will never be granted permanent protection in Australia. The bill reduces Australia's obligations under the UN Refugee Convention. It gives Morrison unfettered power with the ability to 'fast-track' the return of asylum seekers to their persecutors. One of the concessions Morrison made to the cross-benchers to get the Bill through, was to increase the refugee intake quota. Obviously this is a good thing, but it does not justify the disgraceful content of the rest of the Bill. The Bill bangs on about Morrison's power over people who use false identity papers or have destroyed their papers. What he seems to have not grasped is that many asylum seekers don't have papers to start with. It's not like birth certificates are issued in the height of war. Even countries that aren't at war, don't always issue birth certificates. There are numerous people groups who are stateless, such as the Kurds, Rohingya, Hazaras. Their countries of origin don't recognise them and rarely, if ever, issue birth certificates or other identity papers. These laws are not about 'saving lives', they are about appealing to the fear, racism and xenophobia that the LNP has deceitfully spread through the community. When the government isn't accusing asylum seekers of being terrorists, they're accusing them of being economic refugees who've come to Australia to 'take our jobs'. Again, what garbage. Sadly the gullible believe this rubbish because they want to believe it. It's easier to justify racism when there's substance to the claims. The problem is, there is no substance to these claims. Asylum seekers come here to live in safety and security, not to unleash a wave of terror against us. They aren't here to steal our jobs. Yet most Australians still support these policies because they believe the lies the LNP has used to demonise asylum seekers. According to Morrison's own department, more than 90% of people arriving by boat are genuine. Yet the way Morrison and Abbott carry on they have accused them all of being 'economic' refugees who have come here to destroy our way of life. The biggest threat to the Australian job market is unfettered capitalism in which businesses sack Australian workers in order to engage cheaper workers in foreign markets. Most asylum seekers, even those with qualifications, end up in low-paid, unskilled work that many Australians are not willing to do. They rarely end up in high-paying jobs. It should be kept in mind that asylum seekers may not necessarily be poor. Often times, the rich are the first targeted by brutal regimes. So saying that asylum seekers are 'cashed up' is downplaying their fear of persecution and genuine claim to refuge. Besides that, the larger the population, the greater the demand for goods and services, which actually results in job creation, not job reduction. Regardless of the level of the job they have, the more people working means more money in the economy, supporting retail and other industries, creating more demand and therefore more jobs. Australia's aging population means that there will soon be jobs in abundance as baby boomers reach retirement. The boom in babies born post-World War II and the lower fertility rates since the contraceptive pill was introduced means that the percentage of the population working is reducing. Australia needs to increase its fertility rate or encourage migrants to the country in order to ensure the percentage of the population working, and therefore paying tax and spending so the economy chugs along. Asylum seekers, who represent around 10% of the immigration program, are not 'stealing jobs'. They are essential to Australia's economic health and longevity. The amendments to the Migration and Maritime Powers Legislation reveal the evil of Morrison's heart and provides reason for him to front the International Criminal Court for blatant human rights abuses. At the very least, a Royal Commission should be held into the government's breaches of international conventions and its illegal treatment of asylum seekers. What could Morrison do? Well, he could release children into the community. For that matter, he could release asylum seekers into community detention, allowing them work and study rights, while their cases are heard. With more than 90% found to be genuine there is little risk that they won't get to stay and therefore become productive Australian citizens. He could ensure that no-one is returned to a situation in which they may be tortured or killed. The LNP as a whole, could stop blaming Labor every time they get in front of a camera and instead take responsibility for their own actions. It isn't Labor's fault that boats came. There are push factors that drive people from their homelands. While the boats may have stopped coming to Australia, refugee numbers across the globe continue to swell. Given Australia's sponsorship of the Sri Lankan government, the LNP has to take some responsibility in the increase in refugee numbers. The government could also stop spreading lies and fear about asylum seekers and tell the truth: that these are people who are genuinely fearing for the lives and who have a genuine claim to be settled in Australia under the UN Refugee Convention. The government could stop aiding and abetting the brutality in other countries by not returning people to horrific situations. With Australia being the only signatory to the UN Refugee Convention of the countries to the east of Africa, we have a magnificent opportunity to be a shining light of humanity. To show other countries how people are supposed to be treated. We should be encouraging more nations in our region to become signatories to the UN Refugee Convention instead of trying to outdo them on abusive treatment of others. Australia should and could welcome refugees and be the safe haven that we claim to be.